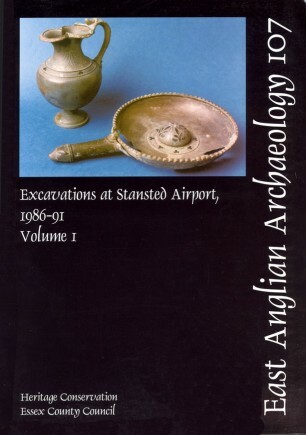 This is an account of the archaeological work begun in 1985 in response to the development of Stansted as London’s third airport. Originally it was conceived as a medieval landscape project, focusing on the three known sites in the area — two of which were thought to be Domesday Manors — supplemented by fieldwalking of the entire development area. By 1991 the fieldwalking programme, coupled with large-scale excavations and watching briefs, had transformed our understanding of the settlement landscape of north-west Essex, with the discovery of extensive archaeological deposits dating back to the Neolithic. The earliest occupation was characterized by Neolithic flint work, and the earliest identified structures were Late Bronze Age/Early Iron Age, with one of the largest pottery collections of this date from Essex recovered from a single rubbish pit complex. Both enclosed and open settlements of Middle Iron Age date were excavated. One of these had an impressive entrance-way and substantial corner structures. A complete defended settlement of the Late Iron Age (75-25 BC) was recorded. It contained a sequence of roundhouses placed around a central square structure, interpreted as a shrine. There is evidence for internal planning of the enclosed space and for the economy of the settlement, including luxury imports. Roman settlement was represented by a series of sites with cobbled surfaces and enclosures, dating from the 1st to 4th centuries. A 1st to 2nd-century cremation cemetery comprised ‘family’ groups of burials. Two of the burials contained spectacular grave goods including bronze, glass and pottery vessels as well as many other items. Environmental evidence demonstrated that agricultural activity continued in the Saxon period although no settlement sites were identified. Occupation flourished in the medieval period, with several sites containing buildings of 12th and 13th century date. The most important of these was a complete farmstead, including barn, dwelling-house, kitchen and byre. All of the medieval sites were abandoned in the late 13th to 14th century. Detailed analysis was undertaken on the upstanding post-medieval buildings, largely 17th century in origin, prior to their removal, and excavation of the below ground remains followed. The report ends by describing the construction of the Second World War airfield and its subsequent transformation as a major international airport.